The point is for them to get the Word of God in their hearts, so that it will help them later. We discuss each verse at the start of the week so that they know what the verse means. I feel that they need to understand it as much as they need to memorize it. If they don’t know what it means, what good will it do them later? Click here to download the printable ABC Bible Verse List for you to use with your class at church and/or your children at home. A — Proverbs 15:1 A gentle answer turns away wrath, but a harsh word stirs up anger. B — Luke 6:27-28 But I say to you who hear, love your enemies, do good to those who hate you, bless those who curse you, pray for those who mistreat you. C — Ephesians 6:1 Children, obey your parents in the Lord, for this is right. D — John 14:27b Do not let your heart be troubled, nor let it be fearful. E — Proverbs 20:11 Even a child is known by his doings, whether his work be pure, and whether it be right. F — Romans 10:17 Faith comes from hearing, and hearing by the word of Christ. G — Mark 16:15 Go into all the world and preach the gospel to all creation. H — Deuteronomy 5:16 Honor your father and your mother, as the Lord your God has commanded you. J — Hebrews 13:8 Jesus Christ is the same yesterday and today and forever. K — Psalm 34:13 Keep your tongue from evil and your lips from telling lies. L — 1 John 4:7 Let us love one another for love comes from God. M — Matthew 4:4 Man shall not live on bread alone, but one every word that comes from the mouth of God. N — 1 Corinthians 2:9 No eye has seen, no ear has heard, and no mind has imagined what God has prepared for those who love Him. O — Psalm 63:1 O God, You are my God; I shall seek You earnestly. P — Psalm 106:1 Praise the Lord. Give thanks to the Lord for He is good; His love endures forever. Q — James 1:19 Everyone should be Quick to listen, slow to speak, and slow to become angry. R — Philippians 4:4 Rejoice in the Lord always; again I will say, rejoice! S — Matthew 6:33 Seek first His kingdom and His righteousness, and all these things will be added to you. T — Psalm 119:105 Thy word is a lamp unto my feet and a light unto my path. U — Proverbs 16:22 Understanding is a fountain of life to one who has it. V — Ecclesiastes 1:2 Vanity of vanities! All is vanity! W — Philippians 4:8 Whatever is true, whatever is noble, whatever is right, whatever is pure, whatever is lovely, whatever is admirable-if anything is excellent or praiseworthy-think about such things. X — Lamentations 3:40 Let us eXamine our ways and test them, and let us return to the Lord. Y — Matthew 5:14 You are the light of the world-like a city on a hilltop cannot be hidden. Z — Luke 19:5 Zacchaeus, come down immediately. I must stay at your house today. 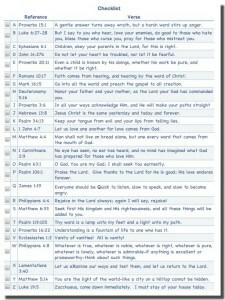 The Printable “ABC Bible Verses” is a great list. Thank you for putting that together! Tony Kummer (Editor) reviewed & updated this page on : February 24, 2019 at 7:50 pm. All our content is peer reviewed by our readers, simply leave a comment on any post suggest an update.